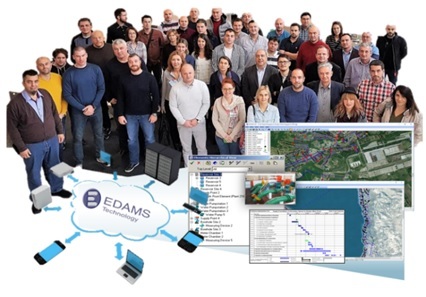 The Programme provides a low cost, low-risk AM solution for small to medium size Water Utilities; achieved through technical assistance and the use of EDAMS AM Software through the Cloud to carry out effective AM for monitoring, operating, maintaining, upgrading and disposing of assets cost-effectively, while maintaining a desired level of service, improving overall Utility performance. The Programme is offered in different packages on a yearly subscription basis, depending on the Utility’s level. Services are provided both on an initial basis (when entering or upgrading to a different Package) and on an annual basis, that will enable the Utilities become fully functional in Managing their Assets. Initial Services include: Data conversion, system setup and configuration, data evaluation, documentation on best practices – standards, procedures & Workflows and training. Annual Services include: Unlimited Remote Support, Weekly back-ups on the hosting server, 30 Gb of additional free storage on the cloud (for photos, contracts, assessments, etc. ), Product Upgrades and Documentation Updates, Access to EDAM Forum with a wealth of user information as well as Questions & Answers. providing immediate answers to the most commonly asked questions. Site-visits can also be arranged on request at an additional cost. Improvement of productivity and efficiency. Additional Services in terms of studies, together with the relevant EDAMS Products include: (a) AM/ Rehabilitation Planning, (b) Commercial Rehabilitation Planning, (c) Network Optimization Plan and (d) Business Planning. Eligible Members are Utilities serving a population of up to 200,000 people. Programme Membership is provided at an annual subscription fee, depending on the size of the Utility, the package and options chosen. An Initial fee also applies to new Members or Members upgrading from one Package to another.